Dominique Kremer is a defender from West Fargo, North Dakota, who recently finished her college hockey career at Merrimack College. Before Merrimack, Kremer played one season with the St. Louis Lady Blues where she captained her team to a district title and an appearance in the USA Hockey Tier 1 national quarterfinals. She then played three seasons for Shattuck-St. Mary’s in Minnesota. At Shattuck, Kremer helped lead her team to two national championship titles in her sophomore and junior seasons. As a senior, she helped the team finish as Tier I national runner-ups and finished the season with 22 points. 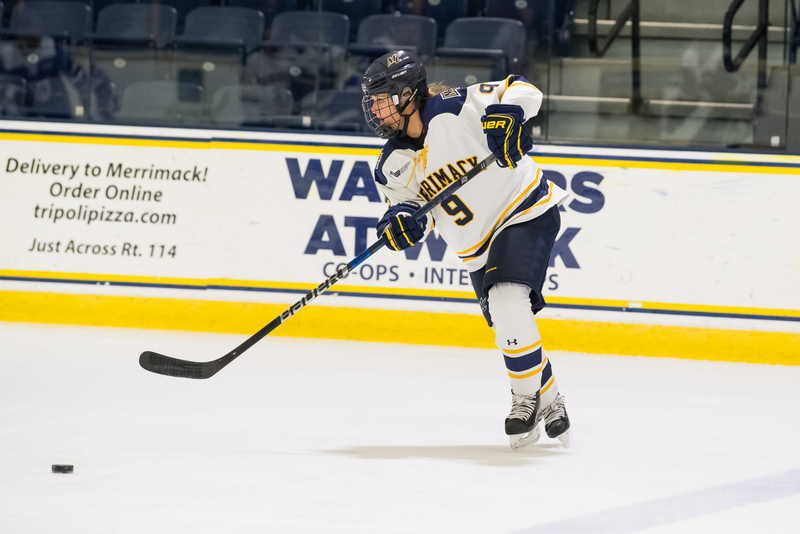 Kremer joined Merrimack in its women’s hockey inaugural season and was immediately named an alternate captain. In 34 games over the course of the season, Kremer recorded two goals and nine assists, good for 11 points, the fourth-most on the team. As a sophomore, Kremer improved to 15 points (4-11-15) in 34 games. Last season, Kremer recorded nine points (2-7-9) in 34 games. Additionally, she finished second on the Warriors with 58 blocked shots. This past year, Kremer had a career high 21 points (7-14-21) in 36 games as Merrimack had the most successful season thus far in their short time as a Division I program. Among defenders in the Hockey East conference, Kremer ranked sixth with 21 points and first with 92 shots on net. She also led her team in blocked shots with 83 blocks. Kremer was recognized for her breakout season as she was named a WHEA Third Team All-Star. Additionally, Kremer was a part of the trio of players who were the first players in Merrimack women’s hockey history to be drafted into the NWHL. In December, the Connecticut Whale drafted Kremer 17th overall in the 2018 NWHL Draft as Kremer joined her two teammates, Katelyn Rae and Paige Voight, as NWHL draftees. Kremer will graduate from Merrimack at the end of the school year with degrees in International Studies and French and a minor in Pre-Law.